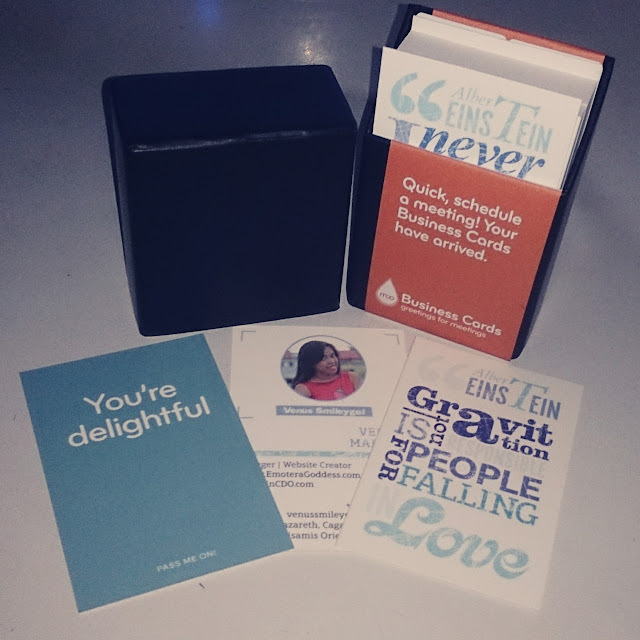 Got a perk from Klout to get new business cards from Moo.com. Thought it was a good chance to finally work on my business/calling cards so it will be convenient for me to promote my blog and give my contacts when attending events. Moo.com is an online print and design company that is passionate about great design and the difference it can make to our customers and the world. MOO launched back in 2006 with the aim to disrupt the $640 billion global print industry and make great design available to all by combining professional design with the accessibility and reach of the web. I like how easy it is to design and customized your business cards on Moo.com. There are a lot of cool templates you can just redesign to suit your personality and taste. You can choose wither square or rounded and gloss or matte paper options. The lowest package is in 50pcs cards. Since Moo is based in London, I paid $4.25 for the shipping and handling. My business card arrived 26 days after, not bad! The business cards arrived with a free moo case. They're recyclable and made of recycled pulp board, but very durable I must say. Have you received a Klout perks from Moo.com too?